The terms “grease trap” and “interceptor” are often used interchangeably. The true difference, as defined by the Uniform Plumbing Code, is derived from the flow rate of each. Passive Grease Interceptors are usually small and found inside the kitchen. 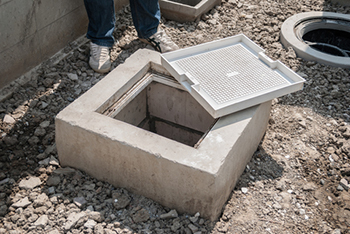 Grease Traps are considerably larger and are located outside…typically a short distance from the building and underground. They can be identified by manhole covers, which provide access for regular pumping and cleaning. An Automatic Grease Removal Device (AGRD) is similar to a passive grease interceptor in location and size. The AGRD is a bit different becasue it separates the FOG from the unit as effluent is flushed down the drain. Also, solids are separated on a daily basis and maintains it efficency throughout the life of the unit. In the late 1800’s Nathanial Whiting designed and received a patent for the passive gravity separator, the device known today as a grease trap. The common grease trap remains relatively unchanged today as a means of separating F.O.G. (fats, oils and greases) from wastewater. A grease trap is an in-ground tank that is designed to limit the amount of FOG and solids from entering the sanitary sewer system. Interceptors hold FOG until it can be collected and removed by a recycling or rendering company. Grease Traps are generally more effective than passive grease interceptors and require monthly inspection and periodic cleaning. AGRD... Efficient, easy to use, and compact. Automatic Grease Removal Devices separate the solids, fats, oil, and grease from the wastewater going down the drains. They are similar to passive grease interceptors in size however, much more efficient due to the ability to eject FOG.. AGRDs are much cheaper to install than a traditional grease trap and do not require long and expensive construction. All Automatic Grease Removal Devices are not created equal, while they do have some things in common. AGRDs do eject FOG instead of storing it, remove solids from the drain lines and protect the lines from sewage blockages. There are two main methods of AGRDs; Mechanical and Non-Mechanical. Mechanical AGRDs use wheels and skimmers to scrape the oil out of the unit and push it out of the unit. The Goslyn AGRD is a non-mechanical device meaning that there are no moving parts. Non-mechanical devices rely on hydrostatic pressures to separate FOG from the effluent flushed down the drain. The Goslyn™ Grease Recovery Device is an immiscible liquid separator designed for food processing & preparation, and other applications that generate Fats, Oils, Grease & Solids (FOGS). The patented operating technology of Goslyn™ separators virtually eliminate FOGS in waste water effluent. There are no moving parts to break and no messy, time-consuming grease traps to clean. Plus, it's small footprint makes it easy to install in even the smallest prep kitchens. Seeing the remarkable Goslyn™ Separator in action will provide you with a true sense of its compact “install anywhere” footprint, ingenious design and highly efficient operation.